Phonemic awareness underlies the foundations of reading and writing. Phonemic awareness can be "taught in the dark" because children listen to sounds while phonics is looking at letters. The need to listen to beginning sounds, final sounds and medial sounds and the ability to understand and manipulate these sounds in words helps a child unlock the alphabetical writing system. 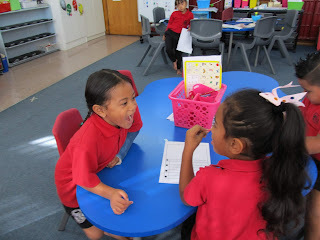 Having fun while learning is important so at the end of term we stepped aside from our usual lessons to have some fun with writing. 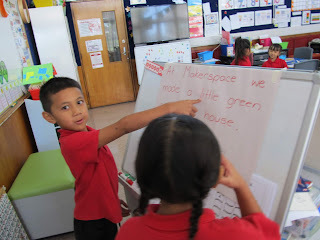 We co constructed a story about a shared experience so that the children had some idea of what we were writing about. The story was written on paper and tapped to the back of the reading corner and teaching station so that only some children had access to the written story. The story would be "dictated" to the writer one letter (or blend) at a time by sounding out the letter or letters. The children were then buddied up in pairs. One child was the writer while the other was the runner. The writer had to listen to what letters the runner wanted him to record to be able to re create our co constructed story. The runners had great fun trying to make themselves understood to the writers. Those that were having difficulty found different ways of communicating what letters were needed. They would say a letter but each time repeat its sound - "It starts like..." then say the sound again. Another runner would use how the letter is made - around, up and down then repeat the sound. 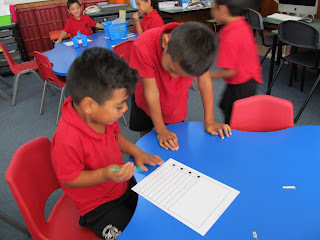 Another way was "drawing" the letter on the table then repeating the sound. Saying the little poem about a letter which repeats the sound also helped others. Then we stopped and read the results and repeated the process with another story after swapping roles. It was amazing to see how the runners were determined to get their message across and stick to the rules that a runner could not be a writer and help out. It was a fun way to show why we need to know the sounds letters make. My Inquiry this year has focused on teaching phonemic awareness in a bid to raise reading progress and help children see that there is a systematic and predictable link between written letters and sounds and to give children a strategy to use on unknown words rather than their previous guesses. Each day I read to the children to expose them to a variety of texts. 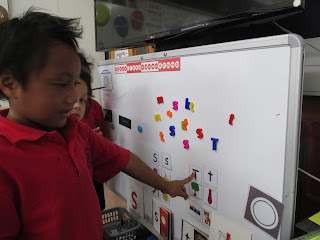 There are labels around the room, a word wall, alphabet booklets and letter activities to "sort and say" for the children to have plenty of experiences with letters and text. They also use their iPads to take photos of things that begin with the initial letter we have introduced and make their own digital alphabet "booklets" of letters. 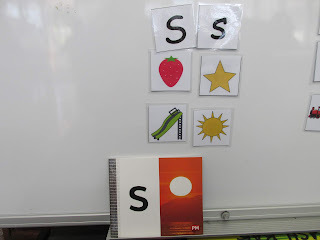 A next step for this activity maybe adding a recording of the letter sounds. Finding a letter "g" and practising the skills of taking a photo, cropping and arranging. During group teaching there is more time to tailor the lesson. I am using individual magnetic letters so the children can notice and manipulate each letter and its position in a word or chunk. 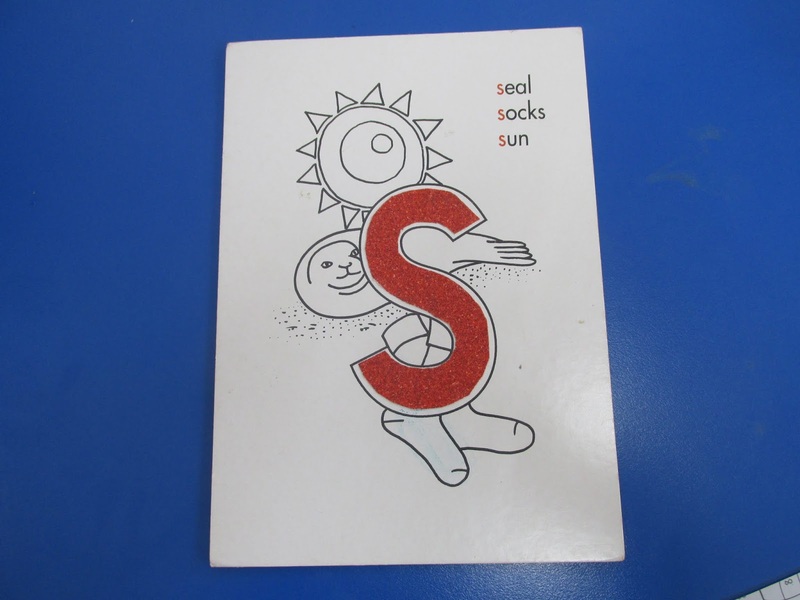 Each letter is introduced with sounds (looking how the mouth and lips form the letter), pictures, actions and time is taken to practise forming the letter in the air, on a hand or tracing sandpaper letters. I have a white board set up with the two new letters of the week plus two letters from the previous weeks. There is a range of magnetic letters both upper and lower case plus pictures that relate to the letters. The children are encouraged to sort and say the letter names and sounds as an activity during writing or reading. I also have another "sort and say" activity with ice cream cones that have lower and upper case letters on them picture "scoops of ice cream" that are stacked up on the cones. This has been a popular activity as the children love to see how many pictures they can stack up. I have heard some of the buddies saying, "You didn't say it right. It's a ...." or "Hey that's not...". So they are helping and monitoring each other. 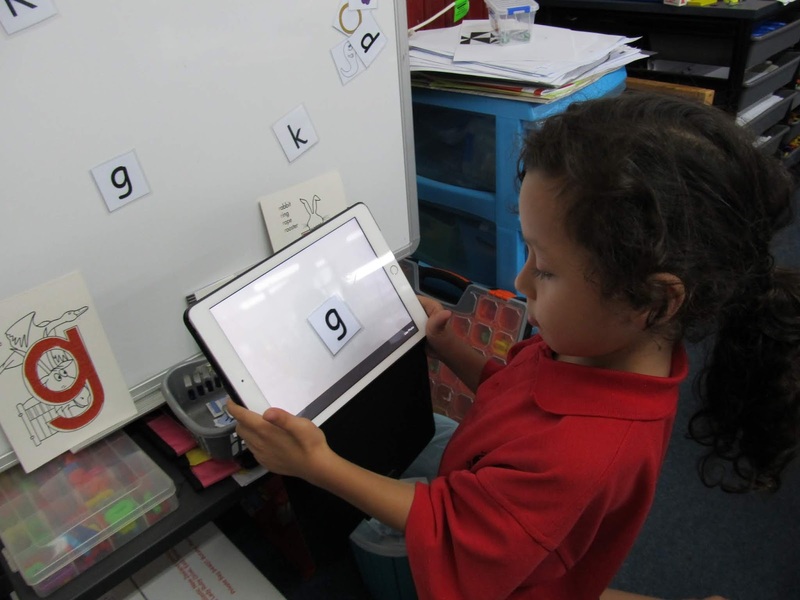 Testing the alphabet letter and sound identification has shown an increase in their knowledge ranging from 14 to 31 letters in a month. 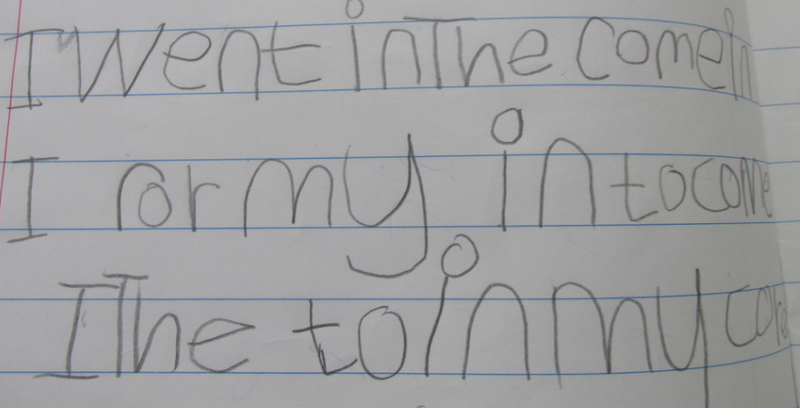 The child who increased the least amount of letters /sounds has picked up far more high frequency words and this has boosted her confidence enough to feel able to correct other children's errors. 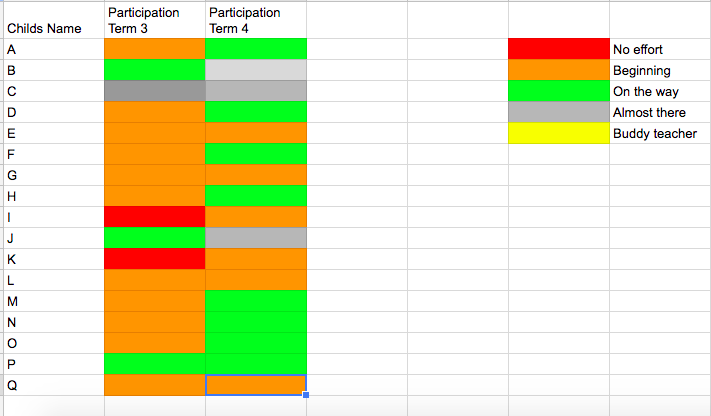 The results for the first 9 weeks reading data has shown a steady increase. I have also been monitoring the children's reading logs to see what practise is being done at home. Child D has great home support to read each night and has been learning her words and letters and is beginning to remember more HFW. One child is beginning to move from noticing that a letter represents a speech sound to letters that go together to make words. I have been teaching them to notice - different shapes of letters and sequencing of letters. Child B was reading a book that contained the unknown word "cook". She stopped reading, thought for a moment then pointed to "look" and said "This word looks a bit like that word. See it has got these same letters here." She pointed to the "ook" part of the word. Then she surprised me further by pointing to a reader on my desk called "My Book" and said "It's like that word too." Suddenly a word family was noticed as another way of working out unknown words. Other incidents of noticing "chunks" of a word within a word and working out the unknown word has helped. "Where" was a unknown word but the child recognised "here" and knew the "w" sound and with support put the two together. Although this child has begun to notice, it is not a strategy that she uses with confidence preferring to revert to a quick guess. It is early days so perhaps with practise she will see that thinking about sounds in this new way is helpful. Getting the children to "get their lips ready" to say the sound and to watch how I put my lips to say a sound has helped with some tricky sounds such as "th" that our children often say as "f". Again noticing small changes in what shape the lips are, where they need to put their tongue and whether the chin is lower down or held higher up and whether they are quiet sounds like "p" or more noisey ones such as "b" will all help thinking about sounds and how they are made. Watching in a mirror will be a next step in this phase. Another next step will be to use Elkonin Boxes - a "say it and move it" strategy to see if this multi sensory approach will help in segmenting and blending. It is a visual way to "see" each sound by moving a tile then dragging a finger to blend it together. I will continue to promote speaking and listening skills through games and activities to hopefully lead the children to a love of reading and being successful at gaining meaning from text. 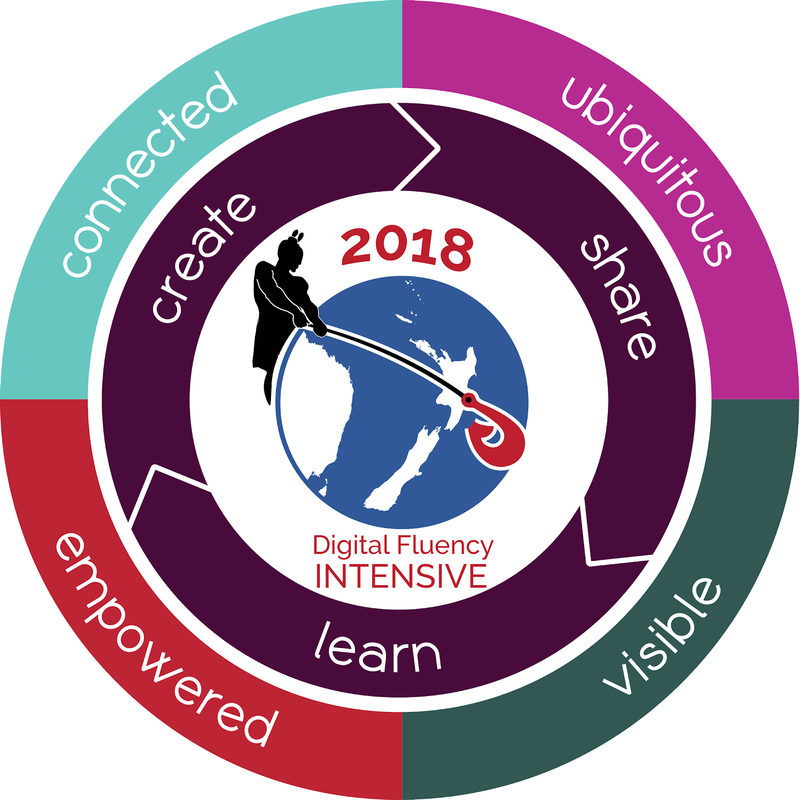 After reviewing the general number knowledge, reading and writing ability levels and letter identification of my new group of students for 2019, it was obvious that I needed to focus my Inquiry on literacy and in particular on phonemic awareness. At the beginning of the year I looked carefully at all my students reading and writing. In writing, if they had ideas to write about, and were attempting to write a simple sentence, I looked at what strategies they used when they came to an unknown word. 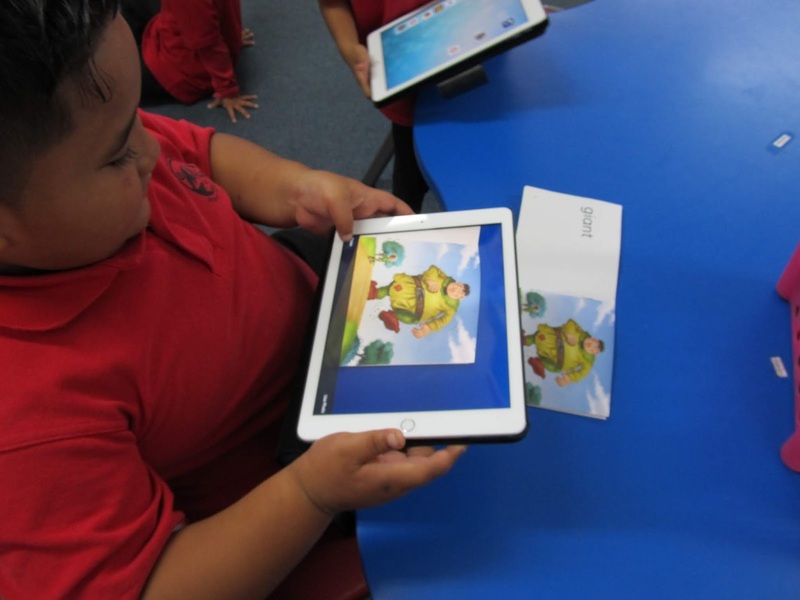 For many in this group they were unable to sound out the word to even record an initial letter and could therefore not use a class spelling resource. Similarly, when looking at reading strategies at unknown words, I found that many of the readers were trying to memorise texts and their patterns. In many early texts the word "Look" is followed by "at". When the text changed to "Look, said Mum", they were thrown. When prompted what they would expect to see if the word was "at" they were unable to say. Testing alphabet sound knowledge showed 3 children had a reasonable grasp of letter names and sounds and that letters had to be put together in certain sequences to make a word. Another child knew all the letter names but had no knowledge of letter sounds. The other children's ability ranged from not being able to identify any letters (not even the initial letter of their name) to seven letters or sounds. 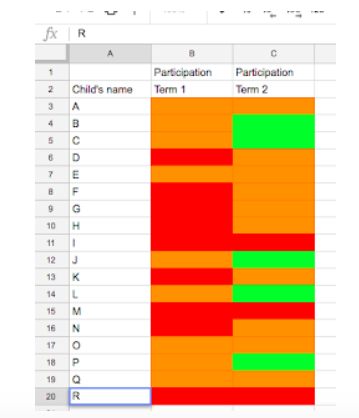 All this information pointed to the need to help the children, and in particular my focus group, to develop a basic phonemic awareness and to see if this would be an effective strategy to move my focus group at least three reading levels by the end of term 2. So I have started at the very beginning. Skill building in phonemes does not come naturally but must be taught so I choose letters that have some meaning to them such as the initial letter of their name. At a class level we work on two letters a week, introduced one at a time. These letters, both upper and lower case, along with pictures of things that begin with the same initial letter are posted on the white board. The children can sort these pictures as well as an array of letters into the two letter categories, saying the letter sound or name as they move the letters. Beside the whiteboard are books with the initial letters and sandpaper letter forms the children can trace over to feel the shape. The children have access to these letter displays as part of their literacy activities. Letter sorting, "I found one like that." For my priority learners, during group reading teaching there is more time for individually tailored teaching of alphabet letter sounds at a slower pace. I have been making the children more aware of how sounds are articulated or to translate how sounds are put together to make a word, and using prompts such as "What can you see... what can you hear...? ", "Which sound can you hear first?" Also asking the question "What do you notice...?" is getting the children to actually look at letters. We use our ears along with our eyes and our brain. We also play alphabet games in those odd few minutes before home time or break time. The children love the competition and are learning to give others "thinking time" or are finding different ways to give clues to help their buddies such as writing in the air with a magic pencil, saying a word that begins with the initial letter, or a little poem about the letter or even saying how the letter is formed. for those who have trouble in recognising a letter. Each child has been given an alphabet sheet to take home along with their reading book. 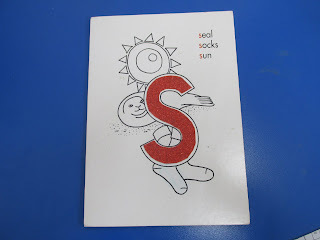 It has upper and lower case letters as well as a picture of an item beginning with the letter. They are encouraged to remember some of the poems we say about a letter which include the sound the letter makes. Being aware of the deficit, and commenting on sounds or letters we encounter, modelling new sounds, correcting any errors promptly, helping to develop strategies to show the link between the spoken word and the written word, I am trying to grow my students knowledge, getting them to notice and to see the importance of knowing their alphabet sounds to both their reading and writing. Hopefully using this knowledge the children will be able to "hear" different sounds that letters make and listen and respond to what they hear thereby increasing their reading levels and writing ability. On Wednesday 20 February Betsy Sewell gave a presentation on Phonemic Awareness to the Junior school. This discussion was very pertinent as we have so many children who struggle with reading. It sounded as if this could be one area that we could use her findings to help these children to gain a love of reading and to be competent, fluent readers who could think about what they are reading and answer comprehension questions. She began her presentation by explaining how complex and challenging English language is with 40 plus sounds but we only have 26 letters thus many sounds are represented by 2 or more letters. To further complicate things English has words that come from Old English, French, Latin and Greek - a sound maybe represented by "sh" in old English maybe written using the letters "ch" in French or "ti, ci, si, su or ud" in Latin! We also have letters in English that our students do not have in their first language. We need to learn the patterns of letters and the sounds they make to be able to make sense of words. Being able to decode may be adequate with reading but the skills involved in decoding break down for spelling. This is because the link between the spoken word and sounds is different. In a spoken word sounds may not be emphasised so heavily. We run sounds together and often children do not hear where one sound begins and another ends. Maybe a child had glue ear when they were learning to speak and could not differentiate the sounds. Saying a word slowly can help a child notice how the mouth is held for different sounds. Some pairs of letters such as "p" and "b" may sound similar but there is a difference in how you say them. By learning how sounds go together they can see that there are repeated patterns in chunks, blends or substituted sounds. Children who have difficulty detecting some of the tricky sounds need to be taught strategies that work for them and then practise, practise until it is secure. In print, letters are necessary seperate and discreet. This knowledge of thinking in sounds and patterns can then be transferred into reading. A competent reader may pause at an unknown word as he notices and absorbs the word, thinking of the differences and how he can put the chunks together using his sound skills, having developed a mental agility to manipulate sounds and make substitutions instantly and effortlessly. He can also use emphasis and expression and think about comprehension because he knows the strategies to use. A struggling reader can not do this automatic processing of sounds and finding patterns. It is unnatural, not instinctive, and leads to the default of guessing. As a child works so hard on looking at the words their comprehension is compromised. 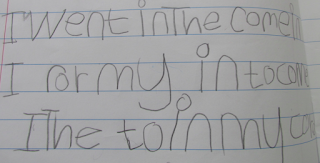 A struggling reader will often invent their own spelling when they write, maybe as they say it. They will try and think of how it looks, look at the Teacher for clues, look somewhere else and hope they will be "rescued" by the teacher who might know that the child has trouble with a particular sound such as "ph" and "f" sounds and always writes "with" as "wif" and will interpret for them. While these strategies may apply more to the older reader who is struggling I am sure there is much that I can take from this presentation to help some of my year ones who find learning the high frequency words and even identifying individual alphabet letter sounds a struggle. Thank you Betsy for your presentation. 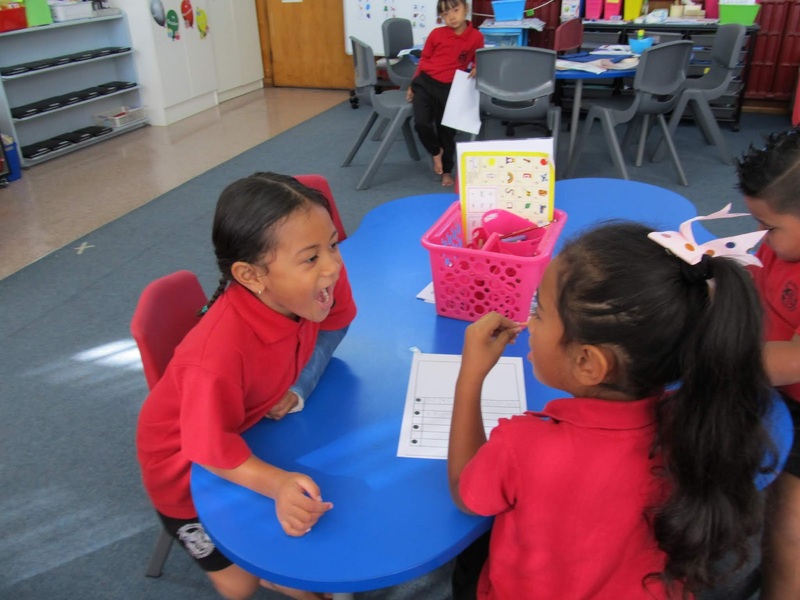 The Manaiakalani schools meet on Tuesday 12 February to review the Woolf Fisher data from 2018 to help us set our Inquiry goals for 2019. We looked at the data from 2018 to celebrate the successes we have had as well as to ask ourselves "What went well/ or not so well?" and "How can we build on this?" or "How can we replicate these results in another area of the school?" It is a great reminder to help us define our thinking and planning. Rebecca gave us some interesting data about the junior area from the School Entry Assessments (SEA) that we do to all children after they have been at school for 5 or 6 weeks. There was wide variation on the number of letters that a child could identify according to the decile of the school (with our decile 1 children able to identify 17.4 letters while at a decile 7 to 9 school they could recognise 34.7) as well as the variation in the number of words a child could read. A similar disparity occurs in other areas with our children shown to have to run so much harder to catch up. We have made a start on improvements in Maths and now we will focus on on how we can best provide strategies for our children in literacy as we plan and set goals for our classes in 2019.